The Digital Transformation Factory Project kicks off in October with a series of online interviews, presentations and articles focused on technological innovations in the production sector. The project culminates on December 12 with a live event at Microsoft, Warsaw, where all the project’s experts will be demonstrating the technology in person. 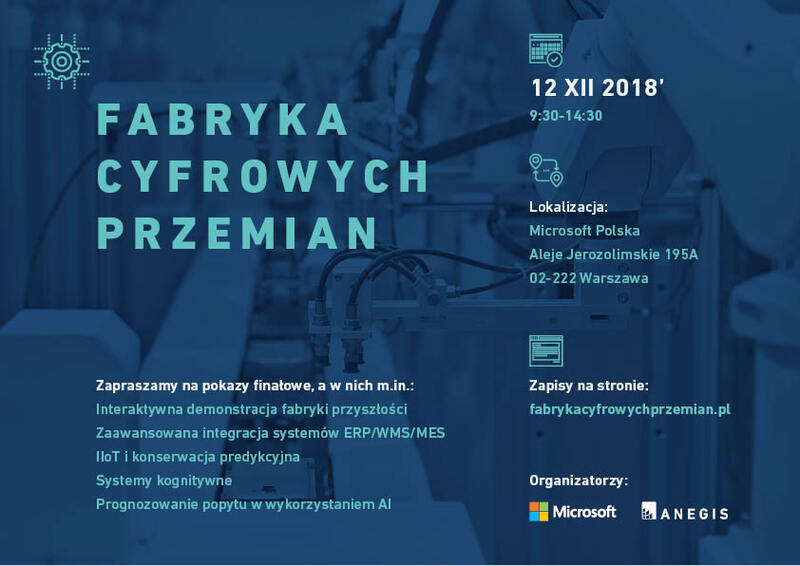 The Digital Transformation Factory Project is a joint initiative of ANEGIS and Microsoft Poland, whose experts will be presenting the latest digital technologies, such as vision-recognition robot systems, Internet of Things (IoT) predictive maintenance solutions, manufacturing enterprise resource planning (ERP) systems, and other Industry 4.0 innovations. Participation in the project is free. Registration is required for the final event - the number of places is limited. Microsoft Poland operates in the field of new technologies, including services in the cloud. Microsoft offers applications and devices that allow individuals, institutions and enterprises to develop their potential. ANEGIS is one of the leading European companies implementing digital transformation solutions. ANEGIS integrates enterprise systems with advanced Microsoft applications that optimise and automate business processes.